1. Recruit the right players. Basketball coaches have teams of people focused on finding the best talent to fill their rosters. They don’t place an ad and cross their fingers, but rather scrutinize every potential player to determine whether they have what it takes. You can do the same. So when you’re recruiting, consider what skills, talent and attitude are needed in this role. To evaluate whether a candidate has them, use behavioral questioning where they give you specific examples of how they dealt with this situation in the past! Consider situational role-playing or presentations to see how your candidate might perform “in action.” Solid recruitment is the key to a high-percentage hire. 2. Make sure they know and practice the fundamentals. By the time a basketball player hits the court in college, he or she has likely amassed thousands of hours of practice—from playing with friends in the neighborhood, leading their middle school and high school teams and trekking from city to city for AAU games. And yet, coaches expect that they will continue to practice the fundamentals, with lay-up, shooting and defensive drills and study their playbooks. No one says, “Coach, I already know how to play!” Are you expecting your team to continue to hone their skills? Are you reviewing expectations and having discussions in meetings and huddles on how to deliver a great customer experience? This is key in continual growth and improvement. 3. Have a sound game plan in place. The coaches of the Final Four teams—Auburn, Virginia, Texas Tech and Michigan State—leave nothing to chance. They don’t just tell the kids to go out there and play a good game. They have a plan, share the plan, practice the plan, execute the plan and adjust it as needed. If you aren’t doing that (both on a short- and long-term basis), get that whiteboard out now! Finally, every coach from every one of the March Madness teams does what their title suggests: COACH! Just watch a game. Coaches aren’t sitting back and hoping that the players do what they were trained to do. Rather the coaches make adjustments in the huddle, pull players out to give them feedback, teach the players on the bench so they’re ready when it’s their turn, cheer them when they’re performing well, give motivational speeches, demonstrate their support for the players when arguing with the refs, and the list goes on. So if your team isn’t on a winning streak, maybe you need to get back onto the court. 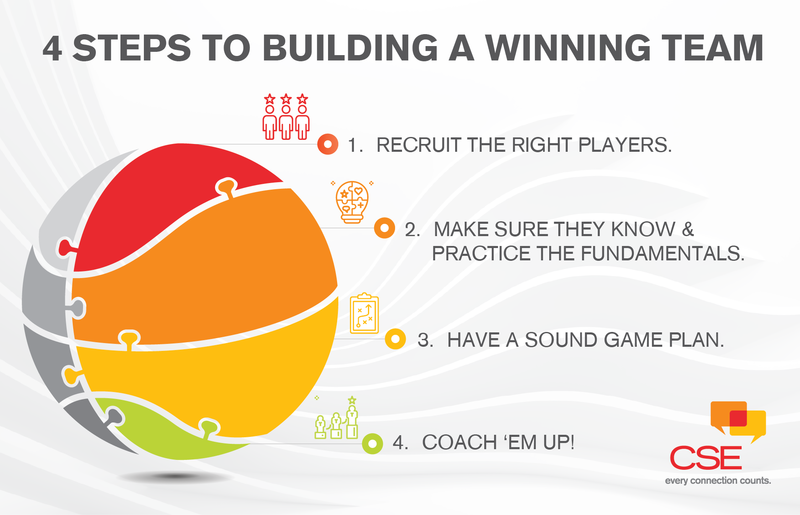 There you have it—March Madness wisdom for building a championship team. If you need more of a playbook on how to maximize your efforts, contact info@CustomerServiceExperts.com. We can help you cut down the nets!